The news that Boris Johnson had resigned as foreign minister after his party finally reached a fragile agreement on their EU negotiating position was as predictable as it was sigh inducing. It also served as another potent reminder of what a cynical and opportunistic politician Boris Johnson has become (or always has been). Lest anyone forget, Johnson was a late addition to the pro-Brexit campaign. During the run up to the referendum he kept then-Prime Minister David Cameron and the rest of the Conservative party waiting for months, while he leaned to and fro, basked in constant media attention, and tallied up which choice would provide him with the greatest political advantage. In the end–despite his repeated assurances to Cameron and others–he opted to stake his political ambitions to the Brexit campaign. The depth of cynicism involved in this ‘principled’ decision was made fully apparent when it later emerged that Johnson had drafted two versions of the article to go with his announcement: one outlining a pro-Brexit position and the other pro-EU and anti-Brexit. Johnson’s political calculus seemed to be that by becoming the predominant pro-Brexit politician he could simultaneously endear himself to the ascendent hard-right, eurosceptic wing of the Tories and market himself to the public as a principled martyr who was willing to sacrifice his ambitions to serve the will of ‘the people’. All of which would sow the seeds for a popular leadership bid. 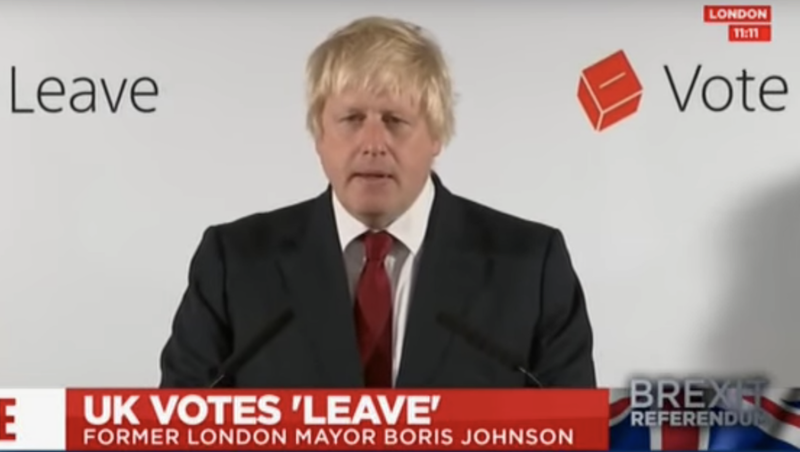 Unfortunately, Boris miscalculated and the Leave vote won. The look on his face the day after the result told you everything you needed to know. But if that wasn’t enough there was also the remarkably pro-European article he released just three days after the result. In the wake of the Brexit vote and with the true scope of the Brexit disaster becoming apparent, Johnson did the only thing that a self serving politician could… he absolved himself from all responsibility. Despite being odds on favorite to become the next leader and thus take on the responsibility for delivering on his Brexit promises, Johnson quickly scuppered his run for leadership. Conveniently blaming his decision on the betrayal of his long term collaborator Michael Gove. When Theresa May assumed power she then took a strategic decision to try and bring Boris inside her political tent–assigning him as foreign minister–rather than leaving him free to rain criticism from the back benches. This was the kind of high profile post that was necessary to satisfy Johnson’s gargantuan ego but it was also a position for which he was uniquely ill suited (as many journalists took pleasure in reminding him). The result? In what should be a surprise to no-one, Johnson accepted the position, performed badly, and proceeded to take every opportunity to criticize and undermine Theresa May. Especially on any occasion where she offered the merest hint of not following the hardest Brexit option in negotiations with the EU. Now with May’s cabinet finally reaching a fragile consensus to seek a free trade arrangement with the EU by adopting a ‘common rulebook’, Johnson has sensed another opportunity for self-aggrandisement and has leapt ship. His resignation–ostensibly motivated by his deep seated commitment to his principles–could force a new leadership contest but only if he can command enough support. 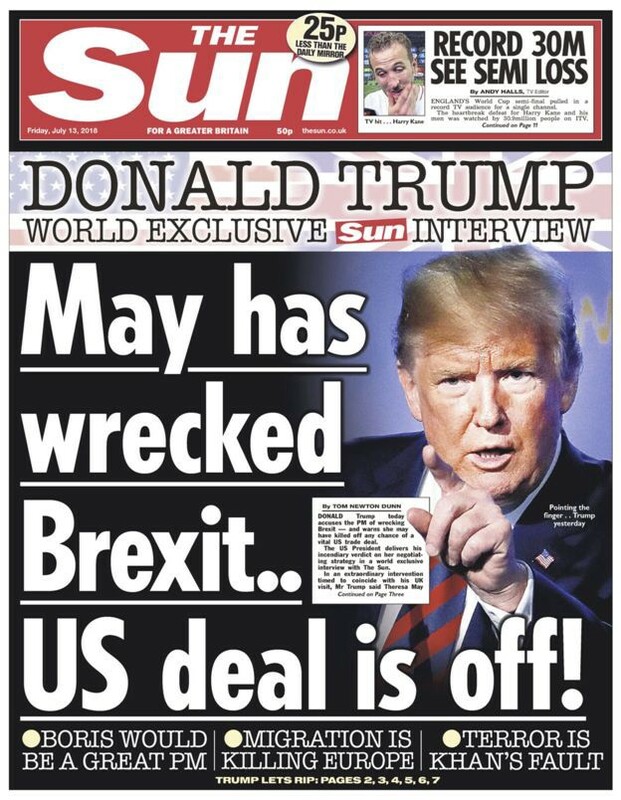 Fortunately for Boris his pandering to the far right has earned him some fans, as evidenced by President Trump’s fawning praise and this front page spread in the Sun tomorrow which notes: “Boris would be a great PM”. As with his decision to support Brexit, it seems that Johnson is currently weighing up his options to calculate what will bring him most advantage. But It would be no surprise if we see a Johnson leadership bid in the next 6–12 months. In short then, Boris Johnson is perhaps the most odious, self serving man currently operating in British politics, which is saying a lot given the level of competition (e.g. George Galloway, Nigel Farage). What makes him somewhat unique amongst this crowd is just how utterly vacant he appears to be of any set of guiding principles or beliefs, beyond those that will bring him more power. 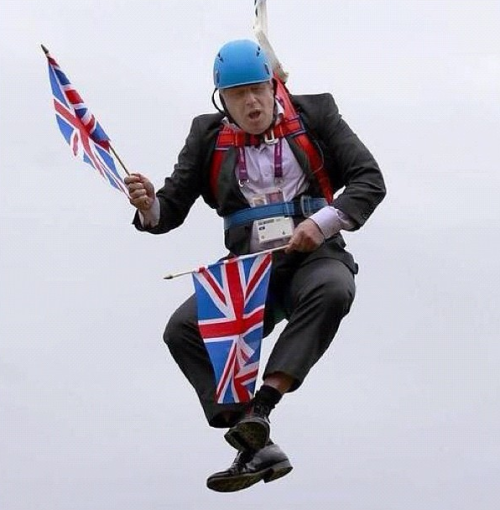 Time and time again good ol’ bumbling Boris has demonstrated that all he really cares about is himself: his party, the country, and the world be damned. I would love it if Johnson has miscalculated and this ends up being his swan song from frontline British politics. Unfortunately, given recent election results, I suspect we will still be hearing from Boris for many years to come.